Growing up, one of my jobs was to clean the pool. Didn’t seem fair that I always had to do it – why not my other siblings? (Please try to get past the whining coming from the child fortunate enough to have a pool to enjoy). The response I got was that I did a good job of cleaning the pool and the others did not. I thought that perhaps they needed more practice!!! If I started doing a poor job would I then be freed from cleaning? What I didn’t realize at the time is that while I was busy cleaning the pool, my siblings had been assigned other tasks for which they were better at than I. 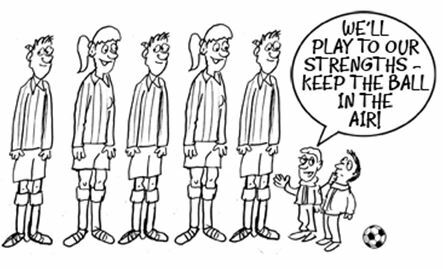 Certainly a great way to run a ‘team’ – identify the strengths and act accordingly! Secretly, a big part of me took pride in the fact that I was the one that did the best job of cleaning the pool AND that someone recognized my ability (plus I was young and foolish enough to appreciate the nice tan I was getting). And that is a big part of focusing on your strengths – when you do something well the emotional rewards are marvelous and when you succeed it fuels your ambitions to continue to succeed. When we focus on our weaknesses, we are continually reminded that we don’t do something well. 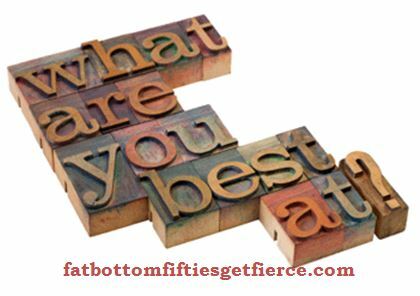 Practicing and practicing and practicing and working to improve on weaknesses will result in improvements, but the effort required will not seem justified as most times we only reap average or mediocre results. There are several books out that encourage the philosophy of focusing on your strengths and delegating weaknesses. Most of them are geared towards corporate or business success – assign tasks based on your individual team members’ strengths which potentially eliminate weak performance areas for the group. These practices are also great for us individually. I read several excerpts, summaries, and reviews of Marcus Buckingham’s book on finding your strengths and focusing on them (Now, Finding Your Strengths). I confess, I did not read it in its entirety but the premise I got really struck a chord with me. We all have things we’re good at – things that we may even be great at if we allowed ourselves to be. We also all have things we struggle with. 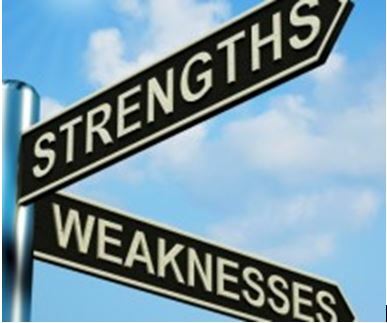 I ran across an article in Psychology Today that listed ten beneficial reasons to focus on your strengths and contained studies that support each. Being happier, experiencing less stress, feeling more confident, are a few of the highlighted reasons in this article. Even if these were the only ones, each is fantastic on its own! I know this much, I am 55 years old and I have managed to find ways around the things I don’t do so well. I did not say I am now good at them, I just said I have coping systems in place. I have never been good about staying on budget or managing finances well. However, there are many programs and institutions and businesses that do all that well. I have been able to set up default systems that automatically pay bills, invest money, save money, etc – thereby eliminating the repeating floggings previously associated with these tasks. I now have time to focus on things that I can do well and can enjoy the feeling of accomplishment. I also have a daughter who loves to organize; she has organized my cupboards and drawers while I polish her resumes and proof read her professional papers. Win – win! You may have a family member, neighbor, dear friend that excel in areas you do not and vice versa. Figure out a way to barter your services for theirs and release yourself from feeling like a failure. Jo Owen, in The Foundations of Leadership, says that you “cannot succeed by dealing with weakness”. Successful people play to their strengths; they focus on tasks where they can make a positive difference. Again, while this was a business example, these principals also work for us in our daily lives. Think about what you are good at, what your ‘default’ mode of thinking and acting and doing is. Are you a people person? Detail oriented? Flexible and adaptable? A motivator or a worker bee? Creative? An idea person? Spend some time cultivating those strengths in your job, your marriage, your parenting, your social activities and your personal dealings with others – all aspects of your life. Focusing on those strengths will make this year an incredibly positive and rewarding year full of fierce growth!